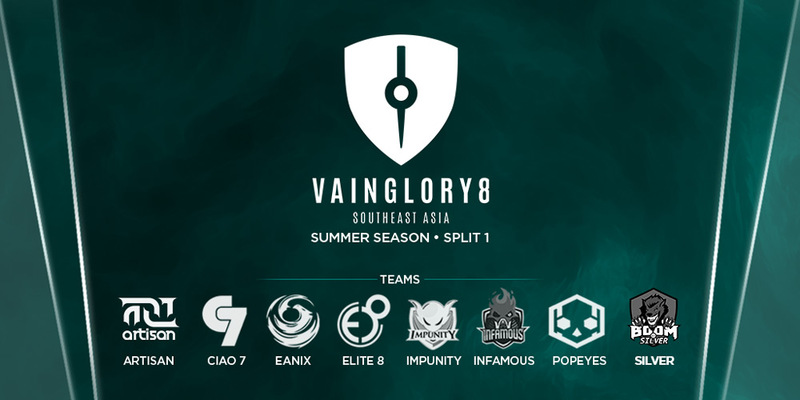 Welcome back to the Support Synergy series! This series focuses on all of the different support heroes available in the Halcyon Fold, and which heroes to pair them with. In previous entries, we’ve looked at Fortress, Catherine, Ardan, Adagio, and Phinn. Today, we’ll be analyzing Lyra. Lyra has seen many nerfs since her introduction, but she still manages to be a popular pick and performs well in most team compositions. 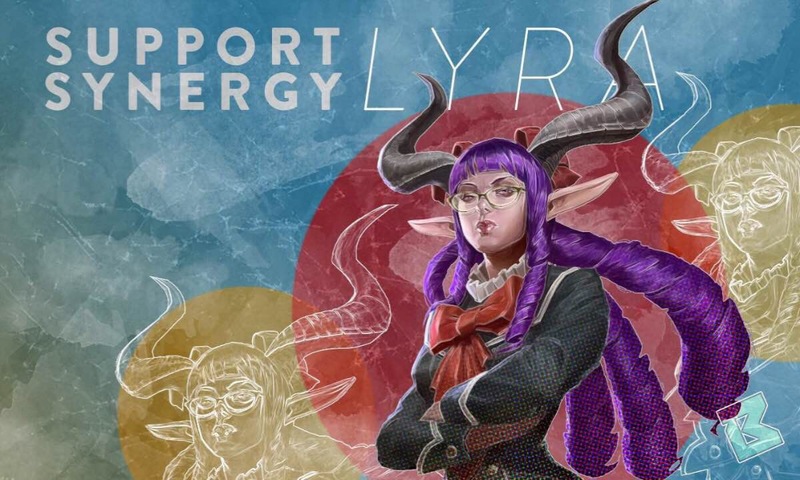 As the meta has shifted towards lane support and sustain, Lyra has become even more valuable. With the reintroduction to her burst heal in 2.5, she should see even more play. As the title of Renaissance Woman might imply, Lyra accomplishes a bit of everything: she heals her teammates, provides peel, dives into the fight, blocks most abilities with her snare, portal mobility, slows with auto attacks, and much more. Let’s look at Lyra’s abilities in-depth to understand how this is all packed into one hero. Even though Principle Arcanum is considered her heroic perk, it functions much more as a fourth ability. When Lyra launches one basic attack, if you do not move her for one second, she will channel another, much stronger attack guaranteed to hit and briefly slow her target. The slow scales with her bonus health, and the damage scales with CP. Attack speed shortens the amount of time required to channel. This slow can be used to provide poke in lane, slow a fleeing enemy, or to keep distance between a kiting ally and a pursuing enemy. This is Lyra’s bread and butter. Lyra throws a circular sigil onto the ground at a target location. While the sigil is active, it will heal allies and damage enemies standing on it, with its duration shortened for each affected target. Lyra can also reactivate the ability to provide a burst of healing and speed to allies, and a burst damage to enemies. You can use this ability to provide sustain in a team fight, peel for a fleeing ally, or chase down a fleeing enemy. You can also utilize the healing and speed boost to keep yourself alive in a pinch! Like the rest of Lyra’s kit, the Bulwark is an extremely flexible ability. When Lyra pops the Bulwark, she creates a barrier around her similar to Ardan’s Gauntlet. Enemies in the barrier are slowed and “snared,” meaning they cannot use any “dash” abilities, like Glaive’s Afterburn. If an enemy attempts to use a dash ability into the barrier, it will be stopped at the wall. Like her Sigil, the Bulwark can be used to stop fleeing enemies, or aid fleeing or kiting allies. It can also be used as a hard counter to enemies with multiple dash abilities, such as Alpha or Blackfeather. Lyra creates a two-way portal from her current location to a target location. This is one of the only abilities in the game that allows enemies to use it just like your teammates. Your portals are best used in tandem with your Bulwark, as enemies inside the Bulwark cannot enter the portal until the Bulwark disappears. You can either portal on top of enemies and pop your Bulwark to engage, or pop your Bulwark and portal away to disengage. You can also portal into the enemy base to sneak up on the Vain Crystal! For being a support hero, Lyra is very squishy. If you try to play her like Ardan or Lance and stand in the middle of a fight, you will die—and quickly. You’ll often find teams focusing you first in fights to take away your healing and crowd control. Be wary of this, and properly position yourself in fights to avoid falling down too quickly. Lyra may have the most dynamic ability kit in the game, but she needs to stay alive to use it. Additionally, with the heavy usage of Poisoned Shiv, mortal wounds are becoming a more frequent status effect on the Fold. Mortal wounds will shut down Lyra’s sustain, which will either make any teammates relying on sustain an easier task to take down, allow enemies to kill you more quickly, or both. Watch out for heroes with mortal wounds in their ability kit, such as Fortress or Taka, and keep an eye on the enemy inventory for a Poisoned Shiv being built. Lyra pairs best with tanky junglers who can take the damage in the center of fights. She can provide them sustain and stickiness with her Sigil and Arcane Missiles. She also pairs well with ranged heroes who like to keep their enemies at arm’s length by providing them with peel through her sigil speed bursts, portals, and separation with her Bulwarks. As her kit is extremely flexible, though, Lyra pairs exceptionally well with almost any hero. Adagio: Heals, heals, and more heals! A CP carry Adagio paired with a support Lyra will be able to sustain through almost any fight. Pair them either with a tanky jungler who will benefit the most from the healing, or with a third ranged hero and never let your enemies reach you. Either one makes for a killer team comp. Alpha Alpha is a perfect centerpiece for team fights with Lyra as a support. Alpha’s stickiness will make enemies wary of trying to dive through her to get to you and your carry, allowing you to focus on keeping your carry alive and in the best position to dish out maximum damage. Some teams will fall for focusing Alpha on the front lines, which is even better! She’s extremely tanky, and your carry should make quick work of the other team while you sustain Alpha through almost anything. Baron: Baron has some of the highest late game damage output around, but he needs help to get there. Lyra can harass the enemy laner in the early game with her missiles and slows, and heal Baron up so he can stay in lane. This allows Baron to focus on his CS, build up a massive gold haul, and get to that late game power spike as soon as possible. Celeste: Like Baron, Celeste can have massive late game damage output, but she needs support in the early game and protection in team fights to get there. Lyra can provide both. Glaive: Glaive is another great centerpiece to team fights with Lyra as a support. Glaive dares enemies to fight through his front line, and he knocks them away and stuns them just in case they do. Pair Lyra’s healing with Glaive’s lifesteal, and you’ve got yourself one scary cat! Grace: As a brand new hero to the Fold, it’s tough to get a read on her yet, but signs point to her and Lyra making for a nasty comp. Both Grace and Lyra can flex into different roles, so you will keep the enemy team guessing in draft. Whichever role you put them into, Lyra’s Bulwark makes enemies helpless to avoid Grace’s Holy Nova, or vice versa. Pair that with both of their slows and healing, and you have the foundation of a solid team. Grumpjaw: Simply put, Grumpjaw is a beast right now. A nerf might be coming soon, but at the moment, the Grump can jump into the middle of a team fight, slow the entire team, eat the enemy support, and help your carry mow down the rest of the team. Lyra can help him sustain through the fight and chase down any pesky carries trying to run away. Gwen: Though Gwen just received a nerf to her Boomstick, she remains one of the most mobile carries around. Lyra’s slows and snares help her stay out of harm’s way so she can dish out damage from wherever she likes. Ozo: Bounce, bounce, bounce. Ozo likes to chase, dive, and punish enemies in groups. Lyra can demobilize a group of heroes with her Bulwark, making the most of Ozo’s AOE damage. Reim: Reim has some of the best damage output in the game, if only he can get his mitts on the other team. Lyra helps him do just that. Use Reim as the frontline between you and your carry, and dare the enemy team to walk through him. Reim will slow, root, and dish out a ton of CP damage while you sit back, healing and boosting him to keep on top of the enemy team. Samuel: Samuel does well in the lane with Lyra, but he really excels as her jungler. Lyra’s Bulwark allows Samuel to line up slowed, snared, and sleepy enemies for some massive AOE damage with his empowered Malice & Verdict. Pair Samuel’s mobility and sustain with Lyra’s slows, speed bursts, and heals, and the enemy team will have their hands full trying to pin this magician down. Skaarf: Like Baron and Celeste, Skaarf has high damage output in the late game, but needs a hand getting there. Lyra can keep him safe while he burns down minion wave after minion wave, and then protect him in team fights while he has himself a barbeque. Baptiste: Baptiste is a hero who still has not quite found his place on the Fold. Billed as a “midrange” hero, his slows and mini-Gauntlet are nice, but without the ability to chase, he too often finds his targets escaping with low health. Lyra’s speed boosts and sustain provide the chance to bring them to the Reaper. Idris: Idris’ dual build paths paired with Lyra’s flexibility can keep the enemy team guessing in draft. Will he be WP, dashing around in team fights while Lyra boosts him, or will he be ranged CP while Lyra keeps the enemy team at bay? They can pair extremely well together, but sometimes the combined squishiness of the two can make them vulnerable. Joule: When Joule sees a party going on, she just jumps right in. Lyra can keep her healed up and healthy to make sure she doesn’t regret those jumps too often. Ringo: Ringo can dish out heavy damage, and Lyra can protect him so he can focus his target. However, sometimes Ringo needs to stay closer to his targets than other carries, and sometimes Lyra cannot protect him enough to keep the enemy team from jumping on him. Rona: Rona loves to jump into team fights like Joule, and her “Into the Fray” paired with Bulwark can pin down an entire team. Once the Bulwark fades though, enemies can often find their way to safety before Rona can dish out enough punishment. SAW: Nothing quite like the feeling of someone insta-locking a SAW, is there? As frustrating and single-minded as SAW can be, Lyra provides him with great sustain to be the human turret he wants to be, and her speed boosts help counter his slow from the Spin Up. Vox: Like Ringo, Vox can dish out heavy damage and slide out of harm’s way. His short range makes him slightly more vulnerable than other carries though, and sometimes Lyra cannot stop the enemy team from making him pay. Kestrel: Kestrel benefits from Lyra’s slows to make for easier skill shots, but she is often too squishy for Lyra to keep alive if the enemy team catches her out. Koshka: Koshka loves the slows of Lyra’s Bulwark and Sigil’s speed boosts to chase down her prey. As an in-and-out assassin though, Koshka relies much less on sustain than other junglers, and when she dashes out of team fights, she can leave Lyra and her carry hung out to dry. Skye: Lyra’s Bulwark and slowing missiles help Skye, but she has a slow of her own, and given how mobile she is, Skye does not really see the benefit of the speed boost from Sigil. The heal is usually not needed or enough. Taka: Like Koshka, Taka prefers to dash in and out of team fights. Lyra can help with her speed boosts and slows, but often Lyra finds herself pinned down and dead after Taka jumps under his box. As you can see, there are no heroes that Lyra makes worse. She always finds a way to help her teammates somehow, but she synergizes with some better than others. Already a popular hero, the reintroduction of her burst heal in 2.5 should keep Lyra as a top support (and ban) pick in drafts. 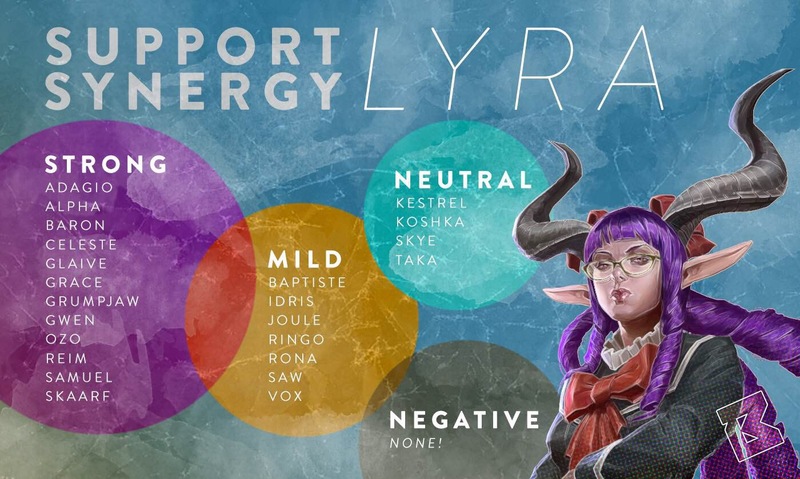 Lyra is flexible enough to help out any team, and can dominate in the best of situations. 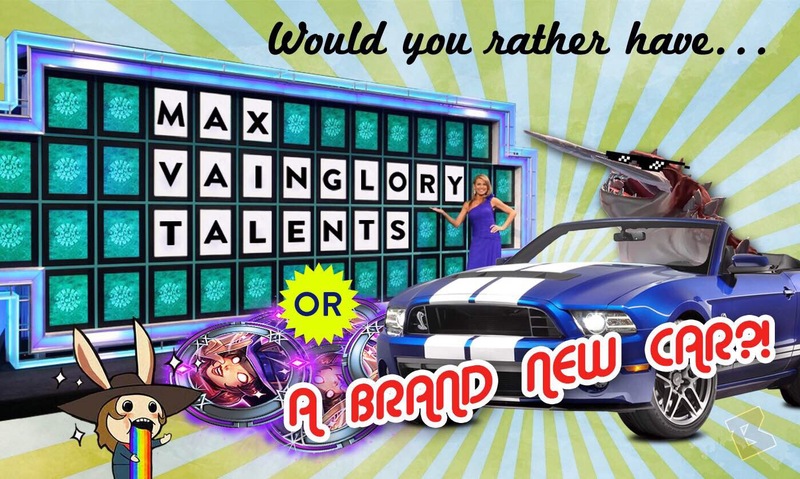 Would you rather have max Vainglory Talents or … A BRAND NEW CAR?